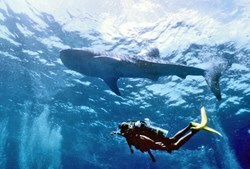 The Whale Shark is the world's largest fish, and International Wildlife Adventures offers individual traveler trips to a small, remote resort on Glover's Reef in Belize to dive and snorkel with these gentle giants during the full moon in March through June. Diving from a small boat is the best way to see whale sharks in their natural environment without disturbing them. It's a whale! It's a shark! It's a whale shark - and it's quite literally the biggest fish in the sea, reaching lengths of up to 40 feet and weights averaging 20 tons. Despite the whale shark's size and relationship to the fearsome shark family, these huge creatures are filter feeders like baleen whales, eating mainly plankton and fish eggs. They migrate to the warm waters of Belize annually to feed on the eggs of spawning Culebra snappers. They generally ignore divers and snorkelers, making for an exciting-but-safe underwater encounter. One of the best and most accessible places to dive with whale sharks is near Gladden Spit on the Belize Barrier Reef in Central America. This reef is the second-largest in the world, next to Australia’s Great Barrier Reef. Whale sharks arrive there with reasonable regularity around the time of the full moon in March through June, when the fish are spawning heavily. International Wildlife Adventures offers dive and snorkel trips to Belize based from a small, family run resort on nearby Glover’s Reef, a protected UN World Heritage site. A spotter network at Gladden Spit where the whale sharks like to congregate helps ensure that the sharks can be easily located. Whale sharks, like most sharks in the world, are a target of commercial fishing, and are considered a vulnerable species. Ironically, the whale shark is known in Taiwan as the tofu shark due to the similarity in the taste and texture of the meat to tofu. International Wildlife Adventures supports Project AWARE, a non-profit organization that works to protect sharks and clean up marine debris. Project AWARE recently featured a story about divers in Mozambique who rescued a whale shark that was entangled in fish nets. International Wildlife Adventures has been offering nature, diving and photography tours worldwide since 1994.